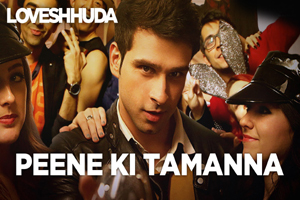 Hindi Lyrics 4 U: Lyrics Of "Pine Kee Tamanna" From Latest Movie - LoveShuda (2016). Lyrics Of "Pine Kee Tamanna" From Latest Movie - LoveShuda (2016). A party song sung by Parichay, Vishal Dadlani featuring Girish Kumar. The video of this song is available on YouTube at the official channel Tips Music. This video is of 3 minutes 00 seconds duration. Lyrics of "Pine Kee Tamanna"
Lyrics in Hindi (Unicode) of "पीने की तमन्ना"